President Maithripala Sirisena says the objective of the new government is to convert the Police service into a real people-friendly service. He was speaking at the concluding ceremony of the program of the first large scale integrated police mobile service carried out by the Presidential Secretariat, Ministry of Law and Order and the Department of Police yesterday (March 27) in Polonnaruwa. This program emphasizes the requirement of a people-friendly police service in Sri Lanka. The concluding ceremony was held at the Nishshankamallapura Kanishta Vidyalaya in Manampitiya. The police Mobile Service themed ‘A Good Society – Safe Country’ has been in operation nearly 100days in the areas in Welikanda, Dimbulagala and Thamankaduwa Divisional Secretariats in Polonnaruwa District. Several public service programs have also been organized in line with this police mobile service including providing of career opportunities to the unemployed youth, offering of the bundles of compact Thripitaka books and Piruwana poth Vahanse, providing ear-aids for the deaf and dumb, providing of pairs of spectacles, wheel chairs and clutches. There were programs on prevention of crimes, getting rid of child abuse, drug prevention, environmental conservation and sanctity and road safety. The President symbolically handed over Tripitaka Books, marking the distribution of comprehensive Tripitaka Books to the temples. During the event he also distributed optical and hearing aids to the people. 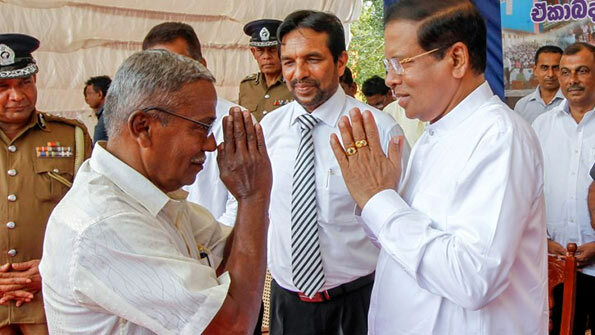 Addressing the gathering, President Sirisena further said that building strong relationship between the society and the police will pave the way to render efficient service to the people. “It is a common situation for State institutions which are working closely with the public to receive compliments and criticisms,” the President said that adding the service rendered by the Police to protect the law and order in our society for its well being is commendable. The President also commended the great service rendered by the Police in collaboration with Security Forces during the conflict era. While eliminating the negative attitudes towards the Police, the Mobile Police Service will be empowered to get the assistance of the Police to solve the problems of the people promptly. Senior police officers, including the Secretary to the Minister of Law & Order, Mr. Jagath Wijeweera, acting IGP, S.M. Wickramasinghe, the Senior Deputy Inspector General in Police Mr. Gamini Nawarathne and others participated in this occasion. Government came to power one year & three months ago. Even now it is not too late to clean up the police. More importantly, Government should not be involved in police matters.